To provide a World-class Club Experience that assures success is within reach of every young person who walks through our doors, with all members on track to graduate from high school with a plan for the future, demonstrating good character and citizenship, and living a healthy lifestyle. 1 in 5 students will fail to graduate high school on time. Over 3/4 of a million students did not graduate on time in 2012. There is a $ 209,100 average lifetime economic benefit of a high school graduate vs. a non-graduate. If we can help just 10 students to graduate on time, we will place over $ 2,000,000 of lifetime earning into our economy. If we can help 100 students graduate on time, we will place over $ 20,000,000 in lifetime earnings into our economy. 29% of juvenile violent crimes occur between 3pm and 7pm. 63% of juvenile violent crimes occur on school days. 30% of middle school children (3.7 million) are left unsupervised after school. 1.1 million elementary school children are left unsupervised after school. Thank you for supporting Lawrence County kids! 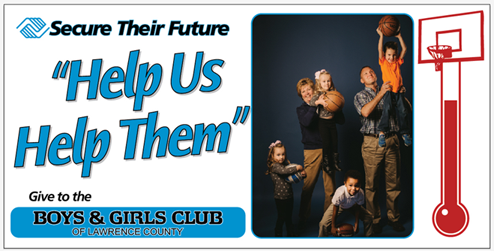 Boys & Girls Club is a 501(c) (3) organization. We are committed to ethical practices, transparency, and preserving your rights as a donor. Click here to read your Donor Bill of Rights. Make your contribution through our PayPal link, or set-up weekly auto pay by using this form and delivering it to The Club or a Board Member. Join our campaign today to find 10,000 people willing to give just $1.93 per week. That equates to just $100 per year individually, but together = sustainability.